Publicity is a wonderful thing, but blatant self-promotion is seen as a negative trait. What’s a library to do? 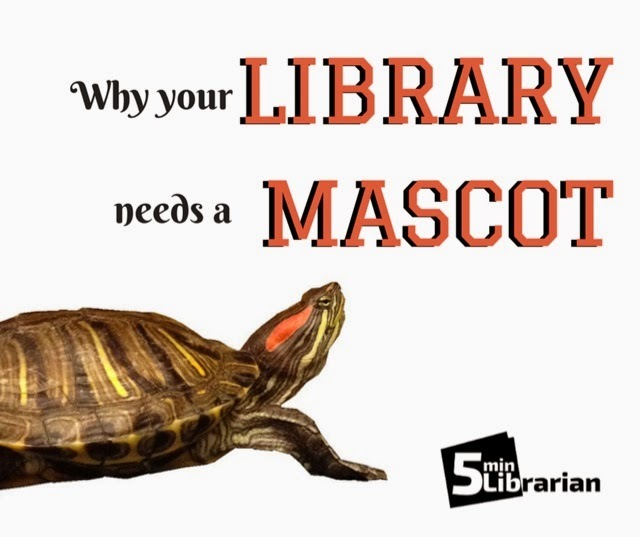 One of the easiest ways to publicize your library is also one of the silliest: get a mascot, and have it do the work for you. Here are some tips to help make the most of a mascot. 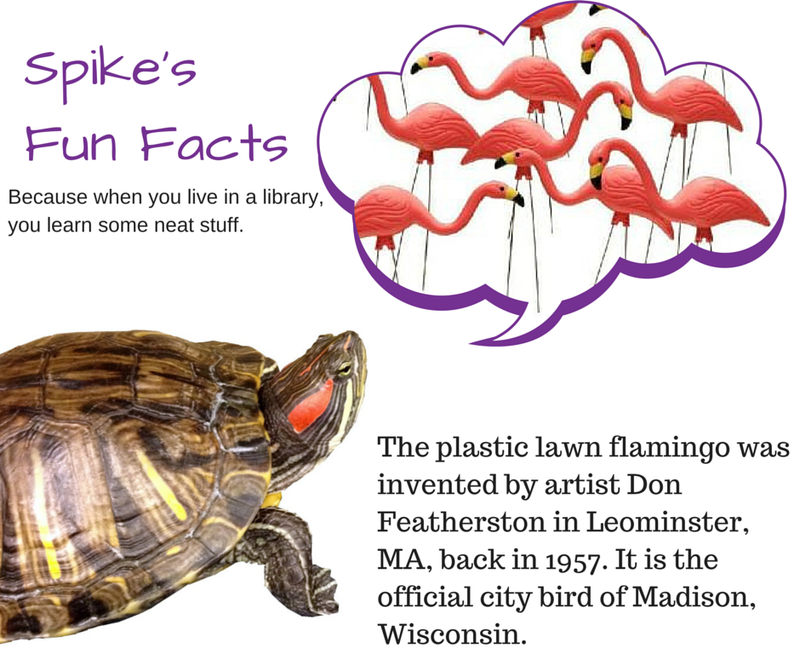 My library has a turtle; her name is Spike, and you will see a lot of her in this article. I have also worked with frogs, stuffed dogs, and a wooden alligator. This mascot will be one of the faces of your library, and one of the goals is to make it a recognizable symbol of the work you do. What makes it special enough that people will remember that this creature belongs to your library? Even if it’s just a generic teddy bear, taking photos of him in a library setting will help people associate him with your library. This photo is a great example; here, Spike rests next to a stack of books. This is also the time to experiment with costumes and accessories. 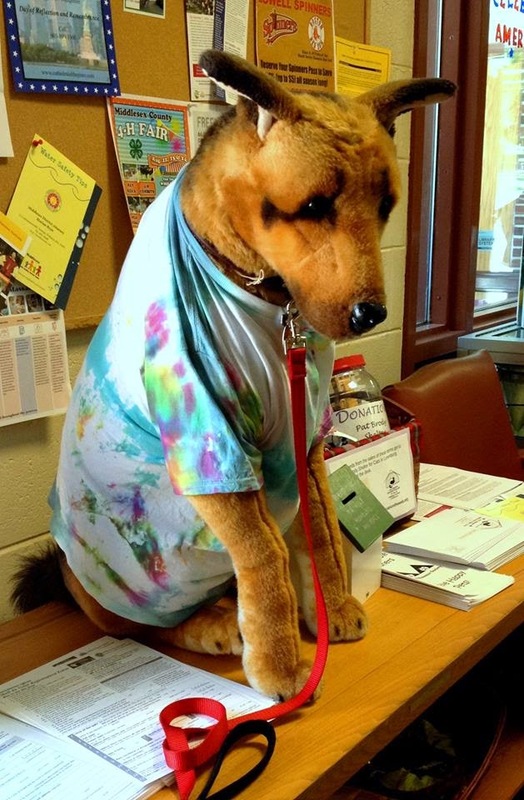 Here, Lucky Dawg shows off his tie dye in preparation for the annual Tie Dye Party at the Lawrence Library in Pepperell, MA. If you are using a live animal, I find it’s easier to tape a piece of paper to the tank or cage and then position the camera to look like they're interacting with their environment, than to actually try to get them to wear an outfit. The library wishing you a happy spring is nice. Your mascot in sunglasses, soaking up the sunshine, will get noticed. There is literally a holiday for every day of the year, so there is not a single day that you couldn’t post a mascot photo if you didn’t have an idea already. 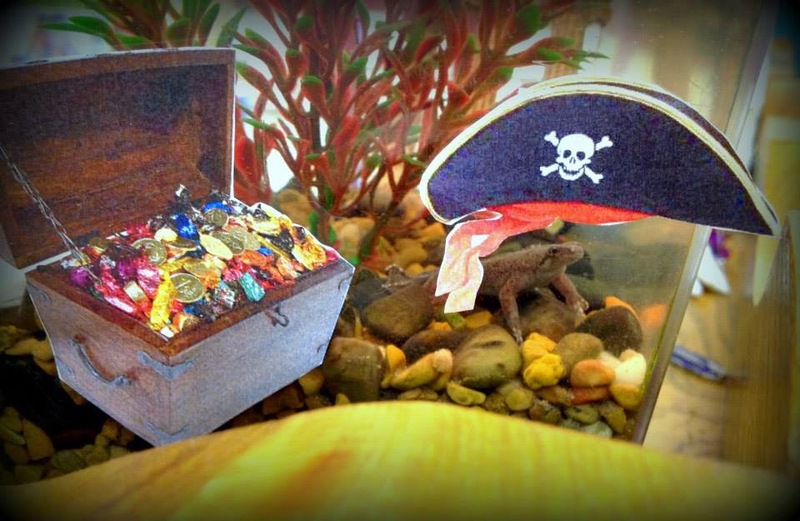 Here, George Frog wishes everyone a happy Talk Like A Pirate Day. Silly? Yes. Memorable? Also yes. Studies have shown that the use of mascots in social media content will boost the number of likes and shares on Facebook, Twitter, and other social media websites. This is likely because people would rather interact with a cute, memorable creature than a “faceless” marketing person, particularly if the mascot is acting as if it’s a member of the staff. (I call this the “He Thinks He’s People” Effect.) Tallulah and Blanche, the gerbils at the Cambridge Public Library, have a Facebook page. Fred, the turtle at the Framingham Public Library, has a blog. Our turtle, Spike, has a series of posts on the library Facebook page that each tell fun facts while reminding patrons of upcoming programs and holidays. Even if there is no specific news, just the appearance of the library in your patrons' news feed will remind them about the library, and perhaps start a conversation. Have your mascot interact with its surroundings; on a slow news day, perhaps your mascot can check out the New Books shelf, play with the toys in the children’s room, or listen to an audio book. Instead of posting a reminder that you have a movie screening at 6, perhaps post a photo of your mascot sitting with a bowl of popcorn, with a comment that they can’t wait for the movie. Is there low attendance at your story times? Is your reading challenge not getting many participants? Try making it mascot-themed! Our turtle-themed children's reading challenge had over 100 participants (in January! ), and turtle-themed story time got a whole new crowd into our monthly Pajama Story Time. I have even done the same program multiple times, but with a mascot theme. A Back-to-School Ice Cream Party got a respectable number of people, but turning it into George Frog's Birthday gave it a whole new life. All in all, a mascot can do wonders for your PR. If done right, it can revitalize lagging social network traffic, create interest in under-performing programs, and show the lighter, more fun side of your workplace, causing a subconscious link in your patrons between the library and happiness – the ultimate end goal. Because we do so much with Spike, I took the time to make a small album of photographs of her. In some of the more generic poses (as opposed to standing next to books, eating popcorn, or wearing sunglasses), I erased the scenery, so Spike is isolated on a white background. It makes crafting posters with her image so much easier! This blog has sung the praises of Canva before, but it bears repeating. By creating a template with her photo in it, we have made it simple to use her likeness on posters, social media posts, and the like. If you do get a live animal (see below), be sure to learn everything you can about their species - not only to give the best care, but also to answer the myriad of questions you will get about them. Posting an FAQ is always helpful. Considering a live animal? A few things to think about. There are several pros and cons of having a live animal in your library. On the plus side, live animals are a huge draw, particularly for children. They are more likely to want to visit the animal, and therefore visit the library, and you will start to hear, “we just wanted to see how [Mascot] was doing.” The novelty of the animal is great for public relations; our turtle has gotten us television and newspaper coverage, and is the first thing new visitors comment on. There are considerations, though. First and foremost, the care of the animal must be a priority. The animal must be taken care of even when the library is closed for weekends or holidays. Will it be okay alone, or does it need to go home with somebody? Also, allergies have to be taken into account in any public building, which is why our library decided against any pet that has fur. There is also the issue of mortality. With a smaller pet, like a fish, you might be able to replace it without fuss, but a larger or more unique animal will be harder to hide, and the issue may have to be dealt with publicly. On the other hand, some animals, like our turtle, can live to be 50+ years; that's a huge commitment! You have to make sure your library staff and director are on board with this choice. Does your library have a mascot? Tell us about him in the comments! Update: We recently wrote a follow-up article of all the mascots we heard about on our Facebook post. Check out the different ones here: Library Mascots, Part 2. We have a mascot, of sorts. This s a church/school library. In 1999 the library moved from a room used for meetings, Sunday school, youth activities to a dedicated area in the new addition. When we moved some one brought along 3 calendar pictures from the walls in the old space of frolicking kittens. They were tacked up right next to the check out and folks, especially the children noticed them. I brought in a doorstop I found of a calico printed cat that had a brick in the base. I used it to keep the main door from opening too far into a spinning carrell I had behind it. We found a couple more posters with cats on them, also. I brought in a stuffed cat made from a museum kit years ago by us, I think from Williamsburg. It sits behind the checkout card box and on one of the cat's pointy ears hangs a key chain. The key is there for teachers to quickly grab if they need access to the A/V equipment closet and they don't need to ask me. So, I guess I am partway to having a mascot. The church has a committee working on a web page and Facebook so I think I will incorporate a cat image for the library section. Athanasia, that's great! With the stuffed cat, you can also create unique pictures like Kat was saying to make your announcements more fun on social media. It is interesting how sometimes, we pick the mascot and sometimes, it just happens. Glad to hear that works for your community! Thanks for letting us know! I'd love to see photos of your little lady! I never thought of taking pictures of the happening-ons in the library with the mascot! Things just got more interesting - on a side note: My mascot has been a hand-puppet of Dewey the Library cat that I received from a Scholastic order. Thanks to your tips, I have integrated this into our Facebook page. People seem to like it, although it's not a living thing. Ahhh- I've always had a "Library Rat" in my school library. The kids and parents love her (them) unfortunately, they don't have very long life spans, so we get our collective hearts broken once every 2 or 3 years. I like to name them after my former university professors.